One sure sign of birthday season is an absence of my blog posts filling your feeds. Every September and October, as I focus on my children and their joyous days-of-birth, I tend to wrap my attention around them, leaving less time to stop, pause, and reflect. Does this mean that I have stopped showing kindness to others? Oh, goodness, no! But my time has been limited, thus impacting my natural ebb and flow of writing. Since my last blog post, there have been countless acts of kindness, too many to recount and post. Nothing spectacular, no grandiose expressions of greatness, just me being me and you being you; small acts of love shared here and there. 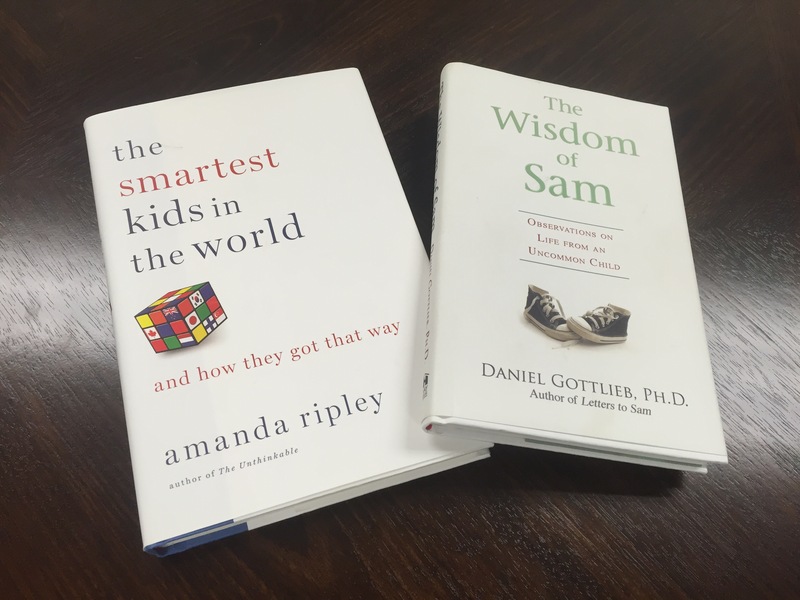 I received two new book donations to our Tiny Tech Cafe which is so exciting! Our lending library is expanding! When was the last time you received an anonymous gift that made you smile? This small ray of sunshine was actually a perfectly-timed gift of compassion. As many of you know, my mom is walking through her journey of Stage 4 small cell lung cancer. There have been ups, downs, and moments where I swear I thought the train was derailed. This was one of those weeks. But these flowers reminded me that all things blossom in their own time and small things matter! So today, I’m celebrating the small things. My mom had to get a lung test today as she struggles daily to breathe and her pulmonologist needs to know what’s going on inside. Right now we are taking it day-by-day. To make my mom smile and focus on other things, I promised her a yummy lunch to celebrate her very first lung test. Then came the main meal. Oh. My. Goodness! We both agreed her Wine Country salad with Raspberry Vinaigrette was much better than my Caprese Panini. How can we live in the moment, if we keep putting off today? Forty-five minutes later, I was popping wheelies with my mom in a wheelchair as we made our way around campus. Today was a good day. My mom got to sit in the Tiny Tech Cafe! So I let go and my mom was free. Her laughter echoed against the walls, her arms outstretched, bracing for impact as the wheelchair gained momentum reaching the bottom of the ramp. For just one moment, there was no cancer, there were no worries, and everything was right with the world. Friends, thank you for being such faithful readers. Thank you for allowing me to pour my heart into your life through my stories. Thank you for lifting me up when I can’t find the words, when my writing comes to a standstill, when my thoughts are going in a thousand different directions, but not a single complete thought is shared. We are sharing this journey of life together and I appreciate being on the road with you. Until next time! Be kind and #CelebrateEverything! The third week of school has brought more and more visitors to the Tiny Tech Cafe! Teachers and students are starting to find their groove with weekly schedules and classes are starting to rotate through the laptop labs. Practically every single day this week there has been a new surprise waiting for me in the Cafe. Wanda Atkinson, a retired MES teacher donated two books to our lending library and Conde Bivins let me borrow the book Awakened by Angela Watson, which I will hopefully order this coming week so other teachers can be inspired, too. Yes, I know, it’s probably a paradox that an instructional technologist gets so excited by printed books, but there’s just something right about holding a book in your hands, flipping through the pages, filling your mind with new insights, new perspectives, or reminders of great lessons learned in the past. We also had a few anonymous donations as well! 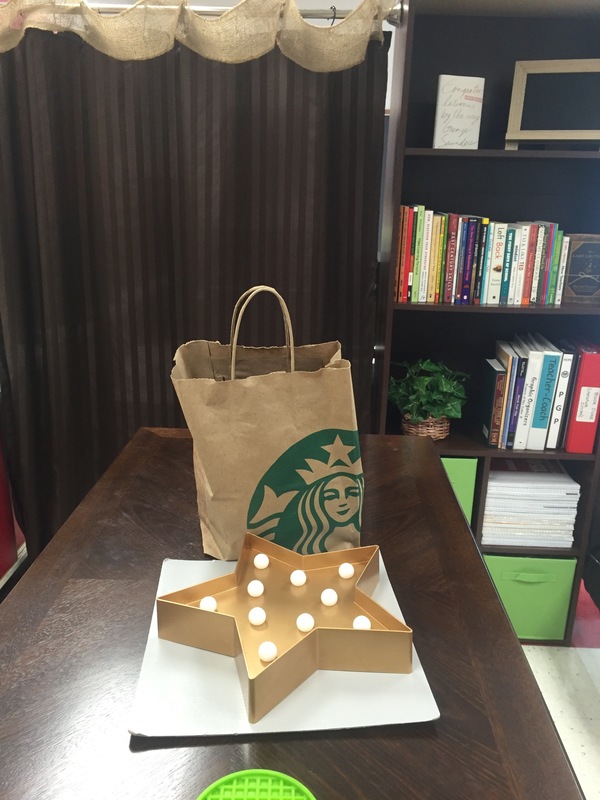 Someone left a huge bag of chocolate with a gorgeous Starbucks mug, as well as a battery-lighted star, perfect for our Green Screen area! 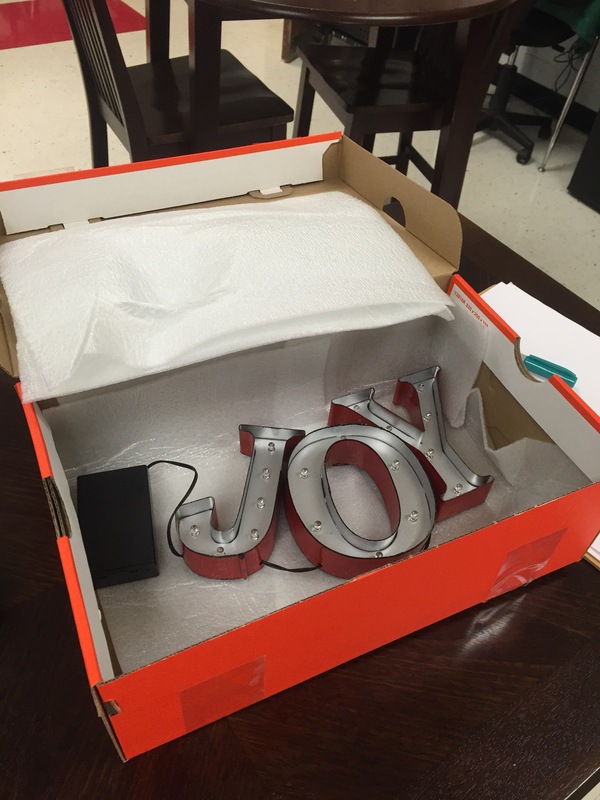 Stephanie Joyner donated some tissues and Clorox wipes and Heather Causey sent a lighted JOY sign that I can’t wait to display! My forever friend, Lisa Zader, donated a set of ceramic tea spoons that were owned by her sweet Aunt Nancy, who passed away earlier this year. 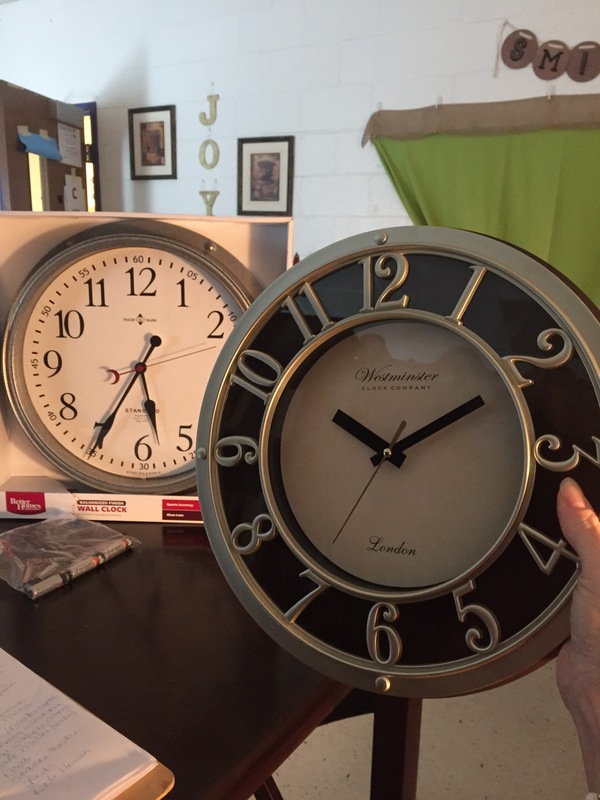 Our principal, Amy Robinson, purchased two clocks for our space: one to replace the wired clock that has long since been frozen at 9:01 and another one chosen specifically for the Tiny Tech Cafe! She even included batteries so we could use them right away! 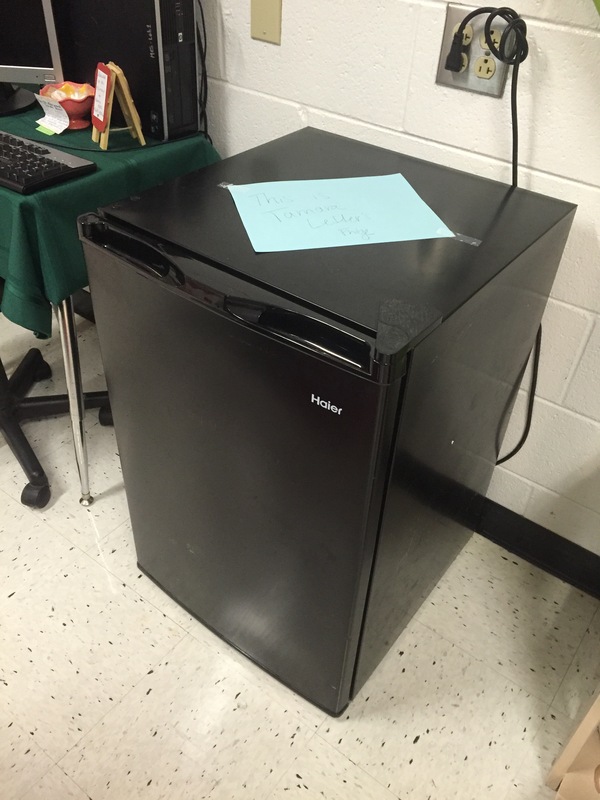 And… Drumroll please… the Tiny Tech Cafe now has a working mini-fridge! Woooo-Hoooo! A special thanks to Suzi Tapper who sent an email to staff saying one was up for grabs – I was more than happy to claim it for the Cafe! Yay! Little by little, piece by piece, our Tiny Tech Cafe is coming together! This week I hope to add more decorations to the walls and start ordering a few books for our lending library. Also, Mechanicsville Elementary is hosting their Back to School Night on Thursday, September 29 from 5:30-7:30 pm. Please stop in and take a peek at the Tiny Tech Cafe! We will have a little Open House of our own before and after the PTA meeting (so 5:30-6pm and 7-7:30pm). I would love to share what YOU’VE helped create! Thanks to each any every one of you who’ve contributed to our campaign! Your kindness means SO much! Feel free to share this blog post with others, too, so they can celebrate with us next week! 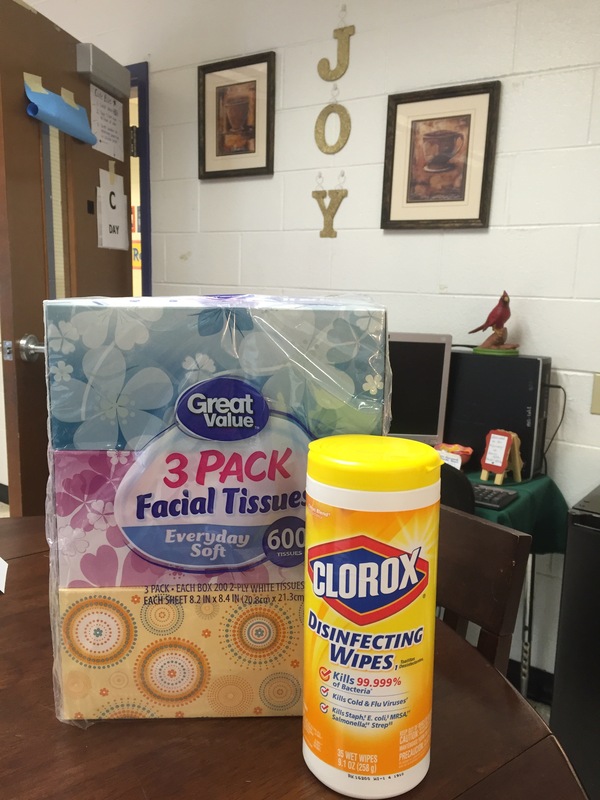 These two items, purchased with funds from our GoFundMe campaign made SUCH a difference in our Tiny Tech Cafe! It’s wonderful to have so many options to either sit or stand! I wanted to create a natural border between the cafe section and the storage area, so I placed the bookshelf beside the sofa with some extra space left towards the wall. Next, I placed a shower curtain rod against the side of the bookshelf all the way to the concrete wall, then used hooks to hang a fabric curtain, which blocked the view of the stacked items. I then covered the hooks with burlap to make it a little more appealing to the eye. 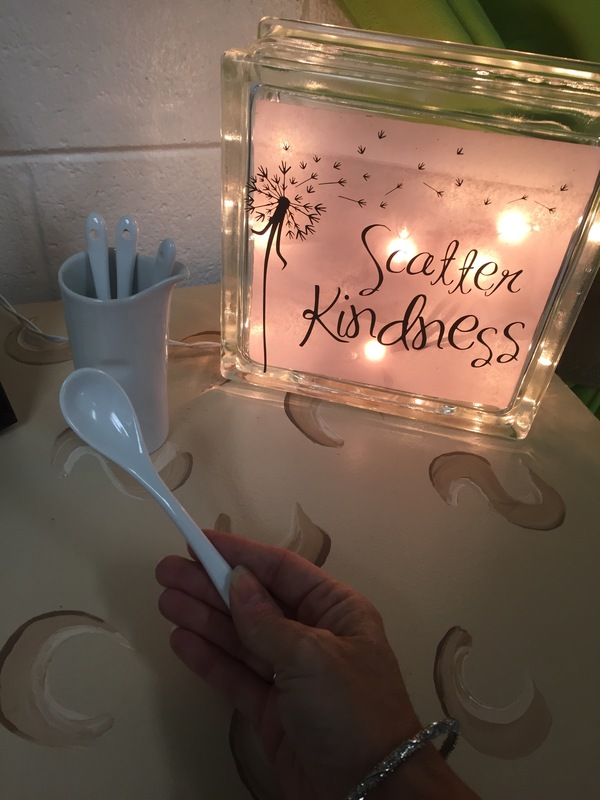 To add to my joy, I had several teachers stop by to bless our space with random acts of kindness! 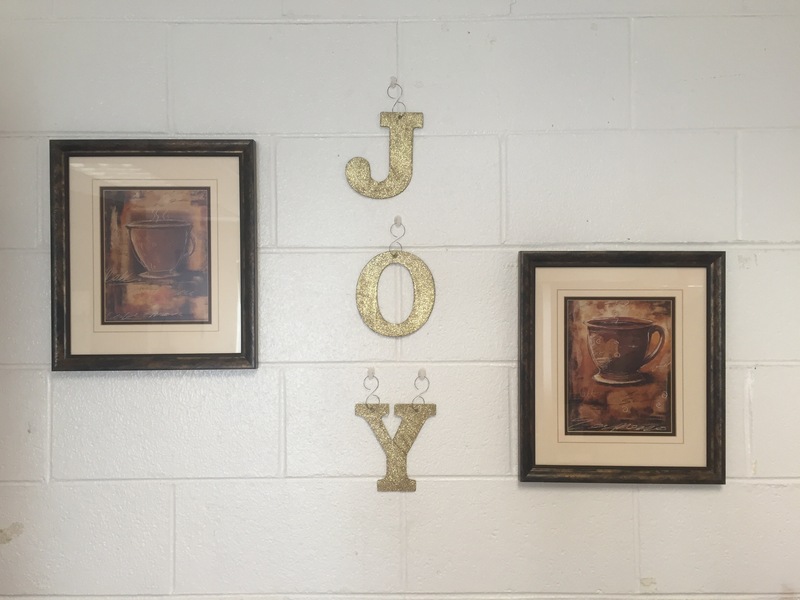 Kristi Oliver created a beautiful lighted display for the cafe saying, “As soon as I saw the words, I knew I had to make it for you.” Talk about a Kleenex moment! Wanda Atkinson, a retired MES teacher also stopped by and donated brand new pillows for our sofa – now we can switch them out with the seasons! We even had another kind friend donate disposable cups and lids, which have already been used by teachers on the go! Oh my goodness! What started off as a little dream to revamp our laptop lab has truly turned into a community project of love! Thank you SO MUCH for your support! Using funds from the GoFundMe campaign, we rewarded two deserving teachers with Starbucks gift cards at our September faculty meeting. Both Melanie Williams and Kristi Oliver (and her son, Matthew) attended eight separate professional development sessions with me last year as we learned about various iPad apps. It was a joy to pay-it-forward by thanking them for being life-long learners who are always willing to try something new! Each day brings a new surprise as the Tiny Tech Cafe continues to evolve in its purpose. I’m delighted to see the smiling faces of students and teachers, popping their heads in to say hello, or sitting down to chat about a project, lesson, or idea. Thank you to all who have donated to our Tiny Tech Cafe. Whether through a monetary contribution or donating time and items, thank you! This space would not be a reality if not for your support. On top of the tissue paper was a card from a fourth-grade teacher down the hall, Krista Miller. As I dug a little deeper under the tissue, I discovered a gift that made me squeal with joy – literally! I rushed down the hall to thank Krista and discovered that she had ordered it from two of our MES parents, JaNette Herndon and Jenni Mouer. This just made the pillow even MORE special! I am so appreciative of their talent and kindness! Now I REALLY can’t wait to get the sofa put up in the lab to showcase this beautiful pillow! Later in the week, I received an additional random act of kindness from our GT teacher, Katie Brockel. She donated a bag of sparkle ribbon and border and blessed me with more fabric and window valences for the Tiny Tech Cafe! How sweet! I still have more posts to share about this exciting week, so check back soon! The Tiny Tech Cafe is starting to really look like a cafe! If you would like to join in as a Tiny Tech Cafe Supporter, please click here for more information! We would love to have your support! This was our first official week of school and our first day on campus was filled with Cardinal love! It was such a joy to stand on the sidewalk, meeting and greeting new and returning students as they piled off the school buses, with bright smiles and eager faces. The school mascot of Mechanicsville Elementary is a cardinal, and one of our parents, Jason Whitlock, transformed himself as the grand cardinal himself, on the sidewalk to welcome everyone back on the first day. What fun! After the kids made their way to their classrooms, I had to sneak in and get a photo with our cardinal… because he made an amazing contribution to our Tiny Tech Cafe! Last week, Jason’s wife, Grace, stopped me at Open House and said she wanted to bless our campaign by purchasing the bookshelf I wanted. What joy! Then, over the holiday weekend, she send me a photo as she was buying it with a note that Jason would put it together and deliver it on the first day of school. Oh my goodness – how amazing is THAT?! The week before I had discovered a little book consignment store beside Big Lots. It caught my eye with the over-sized crate on the sidewalk and a sign saying “Free Books.” What a lovely random act of kindness! I went inside and perused a bit and found a few books I could add to the Tiny Tech Cafe. Now that we were getting a bookshelf, I could really start creating a lending library of educational books for teachers! Sure enough, Tuesday rolled around and there was Jason, a grown man in a cardinal suit carrying a bookshelf taller than me. He brought it to the Tiny Tech Cafe and helped move it in place. I couldn’t wait to fill it up! This REALLY got me excited because it was starting to look more and more like a cozy cafe! As several of you know, Tuesday would have been my mother-in-law’s 69th birthday (she passed away in March of this year.) I created a little memorial area in her memory, dedicating our Tiny Tech Cafe to her. She was an MES parent almost four decades ago and in my early years as a classroom teacher she lovingly sewed fabric to make curtains, tablecloths and room dividers for my classroom. I know if she were still here with us, she would be jumping in to make our Tiny Tech Cafe a place of warmth and love. The ceramic cardinal on top of the computer was painted by my husband’s grandmother, Vera Rapp, who at 93 years old still amazes us with her talent! Even though she lives in New York, I love that she can share in the joy of our Tiny Tech Cafe, too! There’s a saying that when you see a cardinal, it’s a reminder of a loved one who passed away. We have lots of cardinal reminders at Mechanicsville Elementary (and in the state of Virginia, as the cardinal is our state bird.) It’s nice to know we have a cardinal watching over us in the Tiny Tech Cafe as well. Thanks, Jason and Grace, for making my first day back with students an exceptional day! More joy to come! Check back soon! A teacher asked me this question today and it really made me think. What AM I wishing for? What are my hopes and dreams for this Tiny Tech Cafe? Why am I putting so much effort into this space that, unlike a traditional classroom, will be shared with an entire school? I want to learn beside people. Every single person in my school has something they can teach me, from the thirty-year veteran with two degrees to the wide-eyed kindergartener still learning his ABCs. I wish for a space that encourages learning, but in a conversational way. I desire to end the school year more connected, more vested, more committed to my school and community than I am right now. And all these things bring me joy. Even though I made a wish list of things I hope to purchase through this GoFundMe campaign, I took it a step further by taking photos of the items I hope to purchase. These are just a few of the things I need to make my wishes come true! Right now we have $285, so we are still in need of donations just to get the basics in the Tiny Tech Cafe. Today one wish was fulfilled by one of our amazing MES parents – Susan Miller stopped by and dropped off Command hooks which I will use to hang the green screen as well as other frames and canvases on the walls. I am so appreciative of our parent support! A special thanks also to Amy Gregory who donated to the Tiny Tech Cafe last night! She chose the “Expresso” level of sponsorship and earned a magnet in addition to having her name on our donation poster. Won’t you consider donating too? Every little bit helps! Whether you click here to make a donation, or share this post to spread the word, you are making a difference for the students and teachers at Mechanicsville Elementary School. As always, I appreciate your kindness and generosity. It’s exciting to share my vision with you and include you in my joy! Wow – where did summer go? With a blink of an eye, my summer fun with family is shifting into another season of school. Although I took a hiatus from blogging (lots of traveling with no laptop), my days were overflowing with kindness – given and received. Now I’m embarking on another type of kindness and I’ll admit, it’s making me feel REALLY uncomfortable. As many of you know, I’m a technology integrator which means I help students, teachers, and administrators incorporate technology in their own learning processes. It’s an exciting job because technology is always changing, but it’s also a challenging job because… well, technology is always changing! In my school’s computer lab, I have a desk in the back corner and for years (eight years, in fact!) I’ve always told people, “No, this isn’t my room – I just have this corner I work in.” But my corner isn’t really ideal for working with teachers OR students. If someone wants to collaborate with me, they are stuck pulling up a chair on the edge of my desk or, even worse, we have to scrunch up in between students who are seated at the tables with laptops. My vision is to create a space that is open and inviting, comfortable seating and welcoming to everyone, kind’ve like the feeling you get when you walk into a Starbucks. I even have a name for this new area – Tiny Tech Cafe. I created a logo this summer, designing it digitally then painting it on canvas. I didn’t want to get sued by Starbucks, so I made everything my own except for the green circles. I drew the logo and painted coffee swirls on the background. Then filled in the logo with color. I started with a blank canvas. Which brings me to the uncomfortable part. I have the space, I just don’t have the stuff. The things I would love to have in my computer lab are actually pretty mundane. A tall bookshelf with some current educational books available for teachers to borrow. A few round tables and chairs. A sofa to sit on and collaborate. Then my brain gets excited about the possibilities. I could have an area where I offer teachers coffee or tea! I could have another area where I can put up a green screen for students to create virtual reality photos and videos! I could have an area rug and a floor lamp, too! All good things come with a cost and this is no exception. I spent most of my summer scrounging yard sales and online forums for low-cost items and I found some, but not enough to make my dream a reality. I saw an online post about GoFundMe and how they would donate $50 for every teacher’s campaign that reached $250 in donations before the middle of September. So… I did something I’ve never done before. I asked people to help furnish our computer lab. But you know what? When you ask for help, people step up to do just that. They help. So far I’ve had 7 people donate money to my Tiny Tech Cafe campaign. I even had one of my school’s parents offer to buy some Command hooks for me so I could hang all the pictures and canvases I purchased over the summer. Oh, I am so blessed! I still have quite a ways to go to earn enough money to get the things I need, but I wanted to take a moment and say THANK YOU to those who have made a donation. You have truly warmed my heart and your kindness and generosity will be felt by all students and staff at Mechanicsville Elementary! I would love for you to join in on the fun, too, and be a contributor to our Tiny Tech Cafe! Would you consider donating to our campaign or sharing this post? When they say “It takes a village”, it’s so true! In the coming days I will post updates (with pictures!) so you can see how I transform my boring little corner into something spectacular! I hope you find simple and small ways to bless others with kindness. 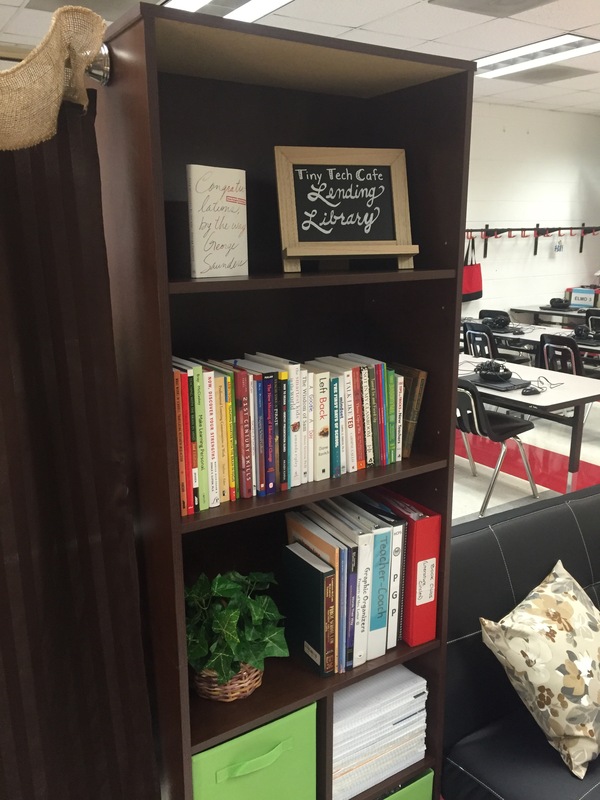 For me, I am blessed to have you as a faithful reader as we kick off a brand-new school year!